Posted byKristine Smets	Leave a comment on Some Secondary Resources for the Belgians in and around Moline, Illinois. Baert, Gaston Pieter. Een “Jongen van Ruiselede”: Edward Andries, Doomkerke 1864-Moline 1958. [A “Boy from Ruiselede”: Edward Andries, Doomkerke 1884-Moline 1958.] De Biekorf v. 59 (1958), p. 137-142; digital image Digitale Bibliotheek voor de Nederlandse Letteren. https://www.dbnl.org/tekst/_bie001195801_01/_bie001195801_01_0050.php. The author provides a ‘glimpse’ into the life of Edward Andries, who was born 24 January 1884 at Doomkerke, a hamlet of the town of Ruiselede, West Flanders, son of Karen and Nathalie Deneve. He was the oldest of six children who lost their parents at an early age. Edward was eight when his mother died, and eleven when his father passed away. He studied carpentry and became a cabinetmaker. By the time he was twenty-one he decided to try his luck in America, as had many of his fellow-villagers. He even had a couple of cousins in East-Moline. In Moline he became a successful cabinet-maker, contractor, and banker. He was active in the Church of the Sacred Heart, and many Belgian-American organizations, and served as Belgian Consul of Western Illinois and Iowa. Edward died 17 April 1958 at Moline, Illinois. Based on a few secondary sources. Baert, Gaston Pieter. “Westvlaamse Amerikanen,” [West-Flemisch Americans] De Biekorf v. 58 (1957) p. 179-183. Digital image Digitale Bibliotheek voor de Nederlandse Letteren. https://www.dbnl.org/tekst/_bie001195701_01/_bie001195701_01_0063.php. Short article which introduces the life of Gustaaf Lesage who arrived in Moline in 1906, settled in Rock Island, and worked in one of the metal factories, briefly zeroes in on the various organizations of the Belgian-American parish of Sacred Heart at Moline, before focusing on the four sons of Gustaaf Lesage who became missionaries: Emiel (b. 1899), Alfons (b. 1904), Cletus (b. 1908), and Maurits (b. 1911). Baert, Gaston-Pieter. “Uitwijking naar Amerika uit de streek van Tielt 1905-1910.” [Emigration to America from the Tielt area, 1905-1910.] De Biekorf v. 57 (1956): 200-21, 331-340. Digital image Digitale Bibliotheek voor de Nederlandse Letteren. https://www.dbnl.org/tekst/_bie001195601_01/_bie001195601_01_0066.php and https://www.dbnl.org/tekst/_bie001195601_01/_bie001195601_01_0077.php. The author uses a list of emigrants from a ledger created by Alberic Verbeke, who was a former agent of the Red Star Line and the Canadian Pacific Railway Company, to analyze the emigration from Tielt, West Flanders, to the United States between 1905 and 1910. He notes that the majority of the immigrants moved to the Moline, Illinois area, and were predominantly men. The entire list is reproduced with mention of name, origin and destination. Baert, Gaston-Pieter. Uitwijking naar Amerika vijftig jaar geleden. [Emigration to America, fifty years ago.] Deinze, Belgium, 1956. 72 p. Reprinted from Bijdragen tot de geschiedenis van de stad Deinze, 1955. Focuses on the Belgian immigrants from Deinze, West Flanders, who settled in Moline, Illinois. Briefly places the emigration in a historical context, describes the chronic poverty which served as a push-factor for emigration, and recounts in detail how a local barber and publicity of the steamship companies enticed young men to try their luck in America. The author provides some statistics, gleaned from the Deinze population registers, and then moves on to describe the Tri-Cities of Moline, East Moline and Rock Island, where many of the Deinzenaars settled, the Belgian-American parish, their organizations, and their newspaper The Gazette van Moline. He mentions many immigrants by name. Bateman, Newton and Paul Selby. Historical Encyclopedia of Illinois and History of Rock Island County (historical and biographical). [La Crosse, Wisconsin: Brookhaven Press, 2001). Facsimile reprint. Originally published: Chicago: Munsell Pub. Co., 1914. 2 v. (1520) p.
Bultinck, Dolores. Belgians in Western Illinois. Miscellaneous Notes from Souvenir Programs of the Various Belgian Organizations and From Personal Interviews with Belgian Settlers. 1969. TMs [Photocopy]. Center for Belgian Culture of Western Illinois, Moline, Illinois. 30 leaves. A photocopy of a typescript which was reproduced by the Center for Belgian Culture of Western Illinois. Prepared initially in connection with Illinois Sesquicentennial. Buresh, Dorothy. Bits from a Battered Beat. Edited by Dolores Bultinck. Moline, Illinois: Center for Belgian Culture of Western Illinois, 1977. Calbrecht, Lucien. Vlamingen te Moline 1840-1976. Moline, Illinois: Center for Belgian Culture, . Six pages, written in English and printed by the Center of Belgian Culture in Moline. Includes brief sections on Father Ceulemans, past of Sacred Heart Catholic Church, the Belgian Consulate of Moline, Belgian culture workshops, Flemish language newspapers, the archives of the Center for Belgian Culture, the Scholarship Fund, Naturalizations, the Lacemaker’s Club, the Belgian Singers’ Group, the Belgian Historical Collection at Black Hawk College [no longer in existence], pigeon racing, rolle bolle, and a timeline for some Belgian organizations. De Smet, Erik. “Eeklose Uitwijkelingen Naar Amerika (XIXe-XXe Eeuw).” [Emigrants from Eeklo to America (19th-20th Centuries).]. Appeltjes van het Meetjesland v. 27 (1977): 5-105. In this article, the article provides an overview of Belgian immigration to America, including descriptions of the organized colonization plans of the Belgian government, immigration laws in the United States, Canada and South American countries, the organizational life of the Belgian Americans. Part two is a chronological list of the 1,529 Eeklo emigrants from 1846 until 1937, with name, occupation, and destination. Followed by a personal name index, and list of destinations. At least 510 Eeklonaren settled in the Moline area. Decker, Chris de. “The Vander Vennets: Pioneer Moline Belgian Businessmen, 1973.” TMs. [Photocopy]. Center for Belgian Culture of Western Illinois, Moline Illinois. 7 p.
Written by a greatgrandchild of Rene Vander Vennet. Includes mostly genealogical information and three photographs. Based on oral information. Historic Rock Island County: History of the Settlement of Rock Island County from the Earliest Known Period to the Present Time Embracing References of Importance, and Including a Biography of Rock Island County’s Well-Known Citizens. Rock Island, Illinois: Kramer & Co., 1908. 184 p. Digital image. HathiTrust. http://hdl.handle.net/2027/uiuo.ark:/13960/t9280ct1f. Another ‘mug book’ from the early twentieth century. Maertens, Diane. “A Glimpse of a Great Belgian Leader, 1970.” TMs [Photocopy]. Center for Belgian Culture of Western Illinois, Moline, Illinois. 4 p.
A biographical sketch of Edward Andries (born Ruysselede, Belgium, 1884) who played an important role in the Belgian community in Moline and East Moline. Morrisey, Mary. Vlamingen te Moline 1872-1972. Moline, Illinois: Center for Belgian Culture, 1972. Six pages, written in English and printed by the Center of Belgian Culture in Moline. Various facts and anecdotes are organized by date. Smets, Kristine. “The Gazette van Moline and the Belgian-American Community, 1907-1921.” Master’s Thesis, Kent State University, 1994. 106 p.
This study analyzes the role of the Gazette van Moline in the Belgian-American community and elsewhere, from 1907 until 1921. Chapters cover the Gazette’s political views on World War I, prohibition, immigration restriction, and the Flemish Question; organizational efforts among the Belgians; and, issues of group-maintenance and assimilation. Includes a list of the agents of the Gazette van Moline, a list of Belgian organizations in Belgian settlements, 1887-1921, and a list of members of the board of the Belgian-American National Alliance. Contains a bibliography, but no index. Stynen, Andreas, editor. Boer Vindt Land: Vlaamse Migranten en Noord-Amerika. [The Farmer Finds Land: Flemish Migrants in North America] Leuven, Belgium: Davidsfonds, 2014).239 p. ISBN 978-90-5908-549-7. Vandepitte, Frank. “Belgische Immigranten in de Verenigde Staten.” Licentiaatsverhandeling, Rijksuniversiteit Gent, 1988. 210 leaves. A comprehensive study of Belgian immigration to the United States. Chapters discuss the timing and magnitude of the immigration; the geopgrahical distribution, occupational life of the Belgians in America; the standard of living as compared to Belgium; Organizational Life; and integration into the American society. Specific mention of Moline can be found on leaves 44 (numbers) 103-104 (occupational breakdown), 179 (organizational life), 186 (group-maintenance). Contains a bibliography but no index. Van Mieghem, Tom. Vlamigrant: Over Migratie van Vlamingen Vroeger en Nu. [Vlamigrant: Regarding Migration of the Flemish, Then and Now] Leuven, Belgium: Davidsfonds, 214. 206 p. ISBN 978-90-5908-529-9. 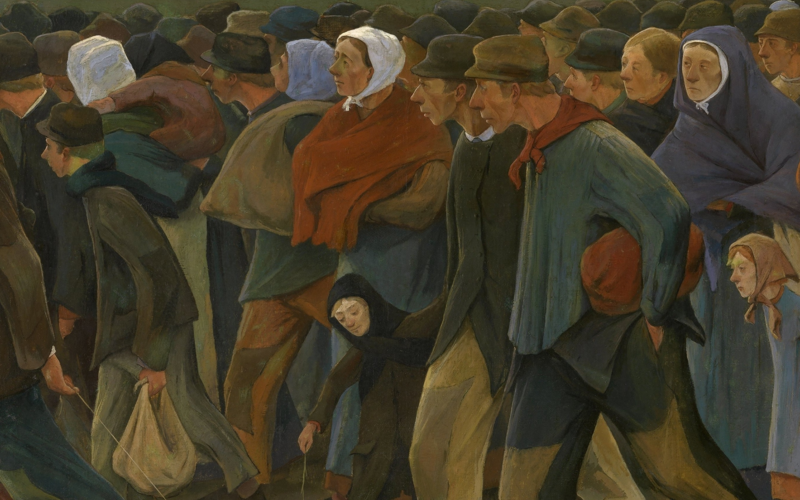 A comprehensive study of Flemish emigration from 1585 until 1945. Moline as a popular destination deserves four paragraphs on p. 93. Excellent background information can be learned from chapters 3 (“Arm Vlaanderen” [Poor Flanders]) and 5 (“Naar Amerika: Het Paradijs aan de Overkant” [To America: Paradise on the Other Side]). Kristine Smets. “Some Secondary Resources for the Belgians in and around Moline, Illinois,” The Belgian American (https://www.thebelgianamerican.com : accessed [date]), posted 29 January 2019. Rita Pearson, “Lady Dorothy Buresh Dead at 90,” Dispatch-Argus (Moline, Illinois), 5 March 2007, Web edition http://qconline.com/news/local/lady-dorothy-buresh-dead-at/article_9e38f4ac-a604-5674-bb1f-132f4fe1487b.html : accessed 28 January 2018).